Sibyl Osicka, Author at Victorian Belle Interiors. I was teaching in California when a student asked me to design a project for her to hook which was going to be placed in the entry way of her home. This gal had a lot of woodcarvings in her home plus leather furniture. Looking over the living room colors. I decided to have a lot of browns in this project and use a black for the background. She had some African statues, so this was my thought on designing ‘African Delight’ (photo in gallery and also in Celebration 2006 article). When I completed the drawing, she asked me if I could make a tracing of it and show her how. which I did. In the meantime, I found a shop close by that carried African heads, and I thought it would be great to incorporate these into the project. It cost hundreds of dollars for these beads, and they were all metal. I knew with the beads sewed on, it would make the piece unique. After seeing the project, she decided not to hook it but to do another one. I put African Delight’ aside for three years and thought someday I would hook it myself. Now. I am happy this happened because I filly enjoyed hooking it and found it to be a lot of fun. For my dye formulas, I used TOD formulas over different color wools, so I would have a great range of colors running from the rusts through the browns. When hooking a motif, I just would pick and choose a value from different swatches to achieve the coloration I wanted. I didn’t follow the values as dyed. By doing the hooking this way. I found it to be very challenging and fun. This is also the way to hook animals, hair, and clothing just to name a few. I had never sewed beads on a project before, so when I went down to Southern Teachers Workshop, I asked Capri Boyle Jones and Diana Hanson how I should approach this. They were so kind and told me the right way to achieve this. This part of the finishing was very challenging for me. because it was hard on my hands. Each row of beads had to be sewn on with wire but instead of using one strand, I used two or three strands. I placed interfacing on the back of the hooking first. and then sewed the strands on. Once the strands were in place from the backside, I then sewed between each bead from the front with sewing thread. If I didn’t do this, the strand of beads would bow forward. With all the beads and a custom made hand tooled rod, this piece was very heavy to carry’ around. Sewing the beads on was a good learning experience, but I am not certain that I would do this again because of the pain in my hands afterwards. I liked hooking the charging lion. because it was a good lesson on hooking teeth and a tongue. I wanted to have the mane look like falling water over the goblet. The other symbols were of African nature. 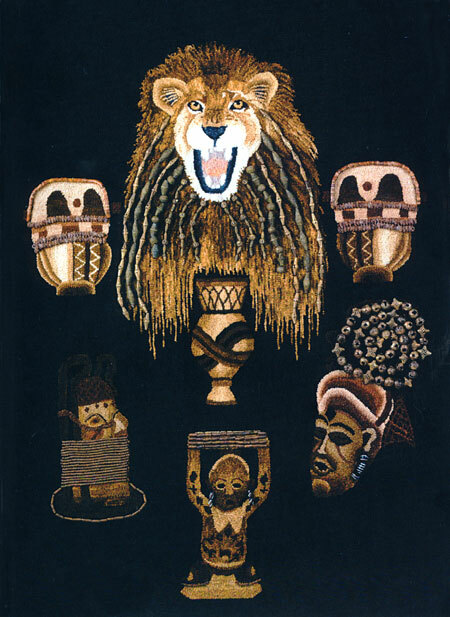 The drums surrounding the lion an; from the Baha area in French Guinea, a savanna people. and an; a different style. The drums arc primarily used for dancing and funerals. The mask on the lower left side is a head of the late period of Benin Art. For the next, I used tiny washers sewed onto two strands of wire and placed row after row on the hooked piece. The strands had to be secured from the front also. The bottom center is a chiefs stool, Baluba Congo. They were carved from a tree trunk and are of high artistic merit. They are usually supported by a figure of a kneeling woman or man or they could be standing, and the seat is resting on his or her head and also supported by upraised arms. Now that my hands have healed, I look on this project with great delight. I am happy I completed it, and I feel comfortable to teach the subjects plus the bead work. African Delight is hanging in my family room but would love to find another home for it. I have Victorian furniture and having this piece in another home more appropriate would be wonderful. My rug “African Delight” appeared in the annual juried exhibit of rugs and wallhangings created by the readers of Rug Hooking Magazine. Please contact Rug Hooking for back issues and access to my article. 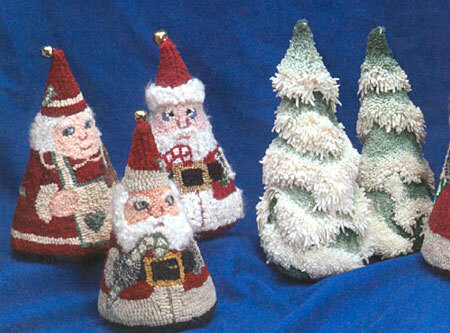 A feature story appearing in Rug Hooking magazine which I contributed to the “Stuffed Trees” section. In addition to being a featured article, my “Down By The Old Mill Stream” rug appeared in the “Stepping Back in Time” article on Currier & Ives. HRMNA is pleased to announce this year’s honorees for the “Rug Hooking Artist of the Year” for Canada and the United States. This is the second year such an appointment is being made. The winners are chosen because of their special attributes and their contribution to the contemporary advancement of the art of rug hooking and its gradual transformation over three centuries of development in North America. Such provides us with an annual assessment of rug hooking in comparison to an early stage of hooking and offers an opportunity to learn more about the amazing talents that exist in the art. Thanks to both artists for their generosity in sharing their art with us for the 2014 summer season. Our Canadian “Rug Hooking Artist of the Year” is Trish Johnson from Toronto, Ontario. Trish has been hooking since 1988. She was self-taught for the first four rugs and then joined the Georgetown rug hooking group. She has taken many hooking workshops and belongs to the teacher’s branch of the Ontario Hooking Craft Guild, the Georgetown Rug Hooking Guild and the Upper Toronto Hooking Guild. Trish hooks rugs about places that are important to her family history, trying to answer questions about what “home” means to her. Home is where the heart is and all of her rugs are about those things and events that are dear to her heart. She designs her own patterns, mostly from her own photographs; dyes most of her own wool (especially the skies) and likes to use some recycled wool from Goodwill. Trish has been featured in Rug Hooking magazine’s “A Celebration of Hand Hooked Rugs”. Our American “Rug Hooking Artist of the Year” is Sibyl Osicka from Parma, Ohio. Sibyl’s introduction to rug hooking began in 1982 because she wanted to make a Victorian style rug for her living room. By 1985, she was sponsored for the Pearl McGown Teacher’s Workshop. Sibyl became accredited in 1989, and was asked to teach two different workshops that year and has been teaching since. She has traveled throughout the USA and Canada teaching and displaying her work. She continues to study and expand her knowledge in all aspects of the art.